Caitlin encouraged me to make these letters & numbers! They are for when I take photos of the baby: to mark how old he is at different points during the first year. To be honest, I was about to give up after attempting the "S", but my mom walked in the room and encouraged me to keep going. I am glad I did! Here is the link. This was the real troublemaker. I committed to making Steve a chef's hat for his skit during VBS week, later in July. The VBS this year is called "Shake It Up Cafe"--all kitchen themed. Steve will be Chef Basil, and that will transform him into some kind of celebrity to the kids, as he was at 2009 and 2010 VBS's, haha. Anyways, after a few failed attempts, the chef's hat finally came together! This is a nursing cover that I found on this site. It was easy, but took me quite a while. I spent a long time choosing the right fabric at Joann's, and this particular home decor fabric had a sale sticker that said "7.00" on it. I had 1.5 yards cut, and got in line, where it rang up to $30! Apparently it was $19.99 a yard, and the 7.00 sticker meant how many yards were on the roll. Luckily, the cashier pulled a 40% coupon out of her pocket and saved me some money. (This was before I learned how to be a Joann coupon connoisseur. A couple weeks later, spending three mornings at Joann's, I was able to buy $74 worth of merchandise for only $13!) I will never buy anything there without a coupon again! 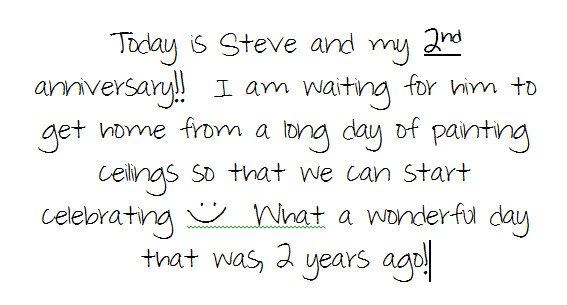 Today is Steve and my 2nd anniversary!! I am waiting for him to get home from a long day of painting ceilings so that we can celebrate. 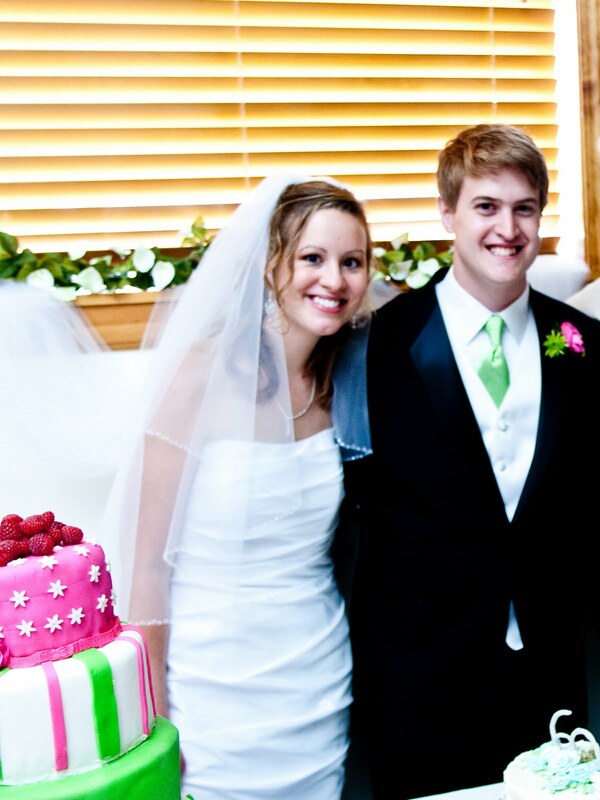 :) What a wonderful day that was, 2 years ago! We started our day off today (at 5:30) driving my mom and stepdad to their bus. They went with their tour group to the airport in DC, and as of three minutes ago, their plane took off for PARIS, France!! I am really thrilled that my mom is getting a chance to see Europe, finally. It really is the trip of a lifetime for her. But I am a little jealous since I am staying here, and I'm little fearful because she won't be able to call me internationally. It's the farthest we've been apart! Anyways, I'm praying for a safe flight and no complications throughout the entire two week trip! I have done quite a bit of sewing the past couple weeks, and I need to take some pictures of my new creations to put on here! I have come very far from buying-my-sewing-machine-and-not-knowing-how-to-use-it. The baby is very active inside. I'm still not big (I was even the smallest in our prenatal education class on Saturday, though a couple other first-timers had same/later due dates than me). He is nearing 3 pounds and 17 inches! I feel like my organs have definitely shifted inside to make room. He has 2-3 names picked out for him, but we won't be announcing anything until the big birthday. I am a little nervous he could be born early, because Steve was a preemie at 32 weeks, and only 4 pounds. Hopefully Steve's fetal stress was not a genetic thing. We now have appointments with our new doctor every two weeks. He may not be as friendly as my doctor in Erie, and the hospital may be a lot less nice than the one in Erie, but it feels good to finally see where we'll deliver! and it's time to get ready to go to eat! We were just listening to an old Maroon5 song called "Must Get Out" that I used to listen to in high school. One line of the chorus is, "This city's made us crazy, and we must get out." As I was mouthing the words, Steve says to me, "Is this your theme song?" Today, at 34 degrees with a mix of snow and rain, I answered "Yes!" Aside from our actual apartment, I feel no strings pulling me to stay here. No one is going to cry when we leave. I will be sad to say goodbye to these four walls that we've made our home for the past two years. Steve and I have spent so much time together in this apartment! But I know that our next place is going to become even more special, as it's where we'll bring home our first baby. I am excited for Easter: to celebrate Jesus' resurrection, relax with my mom, get my hair cut for the first time since last July, hear Steve sing in church, play with my 9-month-old niece Natalie whom I haven't seen since Christmas, make layered Jello, and unofficially start looking for a new home, in a new town. This morning, it is finally sunny outside, with a high of 57! After a week of 30-some degrees again, I am craving some nicer weather so that I can go out and walk comfortably. We even had snow flurries more than once this week! When Steve gets home from his Saturday morning class, we'll head to my mom's house for the day (a 2.5 hour trip). We are going to an all-church birthday party this evening, for all the months of the year. Both of our moms are praying that more than 5-10 people show up after all of the work they put into it. My mom writes the Facebook updates for our church daily, and I think that is a great form of advertising, so we'll see what happens. Steve and I are noticing that I'm growing a bit more this week. I can still hide my stomach, but if I put on a tight shirt, it definitely looks like I've gained the 8 pounds all in my middle. I am slowly on the lookout for a new-ish maternity wardrobe, although I still think it'll be a while before I outgrow everything I own. Baby continues to kick quite a bit, including right now. On the days that I work, baby doesn't seem to move at all. I think all of the kids must sound really scary, or my stress level gets high and the baby gets nervous or something. Last night we got another delicious pizza (I finally found a good pizza place here at the end of our time in this city), and a little while after I ate it, the baby was really dancing in there! Steve just texted me to say that he is the "Outstanding Grad Student" in the English department this year! Yay! I just bought this beauty this afternoon. I was debating what new hobby I should start, and I knew it had to be some kind of art or craft. I've always wanted a sewing machine. My mom's was never in operation while growing up, and all I really sewed were tiny pillows by hand. 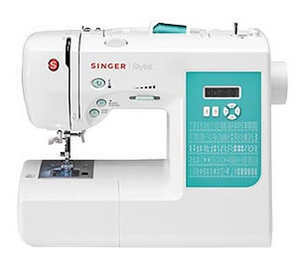 So this "Singer Stylist" is a luxury that I splurged on, in hopes that I will create really cool things. This week was a milestone week in my pregnancy because since Tuesday, I can feel the baby moving! I am still stunned that on Monday, I couldn't feel a thing. Then all of a sudden on Tuesday, I felt every flutter, kick, and punch! It is so reassuring to feel those little movements because it is a consistent daily reminder that the baby is okay :) I didn't expect to feel him/her quite so soon, as I'm still not very big, and it can happen anywhere from 15-26 weeks. I am so glad I can now! It is amazing to feel spontaneous movement coming from inside, from some tiny little legs or arms. Steve has been limping around yesterday and today with an injured foot. He isn't sure if something is broken, sprained, or if he has an infection, but he really can't walk. So I've been worried. (I worry much more than he does about anything). If it's not one thing, it's another, right? and to finish: a little bio of Ivy puppy, who brings us so much laughter. favorite people food: popcorn and goldfish crackers. favorite activities: going for long walks, running as fast as she can in giant circles, waiting in the driver's seat for us to return to the car from a store, playing ball, watching out the window for us to come home, and chewing Nylabone. most anticipated event: becoming a big sister. favorite color: green, of course. On Wednesday night, we went to Texas Roadhouse with one of Steve's coworkers and her husband, who have been married since October. They are a lot of fun to be around, and they are in a similar stage as us: they're preparing to move to Boston at the end of the summer so she can start law school. On Friday night, we went out with another couple and their 3-year-old girl and 8-month-old baby girl. After dinner together, they invited us back to their townhome for coffee and a game. Steve and I left their place saying to each other, "Why are we finding these good friends right before we are moving away?" The dinner that we had on Friday night was a Lenten fish fry at one of the Catholic churches. This is my year as a pretend Catholic, I suppose. I have been to my first Catholic wedding, three masses, I sub exclusively at a Catholic school, and now I am attending Friday night fish dinners. Haha. Our trip to Chicago was so well worth it. We were able to see everyone that I had the goal to reconnect with, even though two days went by speedily. My friendships were really solidified. And now I can go on feeling more confident that these relationships will withstand time and distance. One thing Steve and I really enjoyed was spending time with two young, Christian, married couples who understand us and relate to us so well. It was refreshing. And it was fun to see three of our friends as parents, knowing we'll be joining that club soon. Today, I subbed in 2 year-old preschool. I wasn't quite willing to go this young (I had done 3 & 4 year-olds reluctantly already). But I was asked, so I'll try anything once. I somehow managed to make it the whole time without having to change a diaper. But I won't be that lucky on Friday, when they asked me back. The best part of today was a little boy named Ryan, who bonded with me when I sat down to play cars with him. I was flattered because even though he was a boy's boy, he wanted to stay by my side for the rest of the day, holding my hand and sitting on my lap at times. He called me his friend and got jealous if other kids tried to sit on my lap or steal my attention. So this adorable Ryan, and many of the other boys in these preschool and kindergarten classes that have really liked me, reassure me that if this baby inside is a boy, I will be so thrilled. This is surprising, because for a long time I didn't know what I would do with a boy, having grown up without males in my house. There's a quote on one of the ending episodes of "Friends" where Monica says to her baby boy, "I am going to love you so much, no girl is ever going to be good enough for you." I feel this way. I just got home from CVS, where I purchased 8 boxes of prenatal vitamins. They only last 30 days, so these will carry me through the pregnancy. They were $7 (about half off), instead of the $16 One-A-Day name brand. I feel like I got such a steal! I hope the baby is enjoying my Cool-Whip & Jello love right now. I made pistachio Jello salad and a berry Jello/Oreo pie yesterday which have been extra delicious to me. On to watch some Tuesday night TV, and maybe an episode of Charlie's Angels when Steve gets home from night class. We are almost done with watching the original first season from 1976--I love it. Farrah's hair, their cars, their clothes, female crime-solving: fantastic. Today, despite the rain and fog and possible snow, Steve and I are making a "spring" break for it: to Chicago! Tonight we'll stay with my aunt in Indiana and dine on Chinese food with my grandpa, stepgrandma, my mom's two sisters, and my uncle. Tomorrow morning, we'll drive into the city and start finding friends to catch up with. :) I haven't been to Chicago in almost two years (since graduation), which is the longest I've ever been away from my home city. I often dwell on how time and distance have changed my relationships with so many friends. So it's time to go back for two days, have fun, restore friendships, and eat a lot of my favorite pizza. Mmm! I used a pencil sharpener to shave crayons onto wax paper. Then with the crayon shavings sandwiched between the folded piece of wax paper, and a piece of brown kraft paper over the wax to protect it, I ironed the crayon shavings on a low setting which instantly melted them. Once I had used four crayons, I cut out hearts freehand. Then I punched holes in them, and hung with them with a thick red thread. They look really pretty when the sunlight hits! I've been following a few blogs for months now, maybe even a year. Every so often I draft my own post, then I go back and delete it. This is why I don't journal actually. I can remember trying to start journals: writing a page, feeling satisfied, maybe writing another page. Then I'd go back to it, hate my handwriting or hate the way I sounded, then I'd tear it up. So here is a promise that I'm not going to press the delete button on my blog. This is it. I suppose the biggest reason why I am ready to blog for real this time: I have a topic to write about! As of today, I am 13 weeks pregnant, which means I'm officially graduating to my second trimester!! This is really good news, as the first trimester is probably the least exciting of the three. I am not showing yet, and have not gained any weight (which is good! ), but I am ready for people to tell just by looking at me that this baby is on its way! I am excited to start feeling the baby move inside. When we saw the sonogram on February 8th, we could see his/her little arms and legs flapping, and I can't wait to feel the movement! 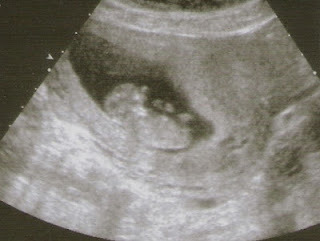 I still can't believe that this is working, that I am capable of growing a baby! We heard the heartbeat for the first time on Monday. We went in to officially meet the doctor, who is really really nice and had a smile on his face the whole time. I am disappointed actually that I won't deliver the baby with him. (I'll mention why later). Then he put the doppler on me to search for the heartbeat. When at first we didn't hear anything, I got nervous. But he moved it even lower (I didn't know babies were that low!) and we heard a fast, loud beat that Steve says sounded like bongos. How cool! Right now my only major symptoms of pregnancy are that I require extra sleep and extra food.